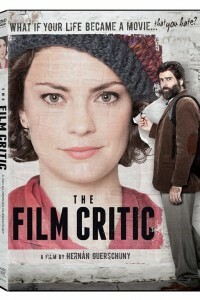 In The Film Critic DVD, Victor (Rafael ) is a dissatisfied, world-weary Buenos Aires film critic who prefers to think in French and eschews romantic clichés…until he finds himself living one. Riddled with ennui and the  maladie du cinema, Tellez drifts from screening to screening in search of cinematic perfection, casting judgment on filmmakers and their films with scathing incisiveness. But one day, while looking for a new apartment, he meets Sofia (Dolores ), a lovely, thrill-seeking young woman in a pink bicycle helmet and yellow tights, a chance encounter that jars him into questioning his meticulous, intellectual routine. In time, Victor realizes there’s more to his own story than he ever dreamed, while learning that value of the kind of emotionally uplifting story that he has disdained for so long. A nominee for the International Jury Award for Best Feature Film at the São Paulo International Film Festival, The Film Critic is the kind of frisky, high-spirited spoof that’s none too shy about including such rom-com staples as a kissing scene underscored by fireworks, a shopping montage, or even a climactic race to the airport.